Damo and Vikki's Round the World Trip! : New York Highlights! We spent the first week of our trip in New York City and flew from Manchester to JFK with Pakistani Airlines, which came up the cheapest by far on SkyScanner! I would totally recommend this airline, I was so nervous about it but they were just as good as any other airline I’ve flown with. They even allow each passenger 2 suitcases each, not that we could take advantage of that one! Once we landed it took forever to get through customs, then our cases didn't turn up for ages!! Finally we got them then got the AirTrain from the airport to a station called Jamaica, then got on the subway to Penn Station, which was right by our hotel. This was a really cheap way of getting into Manhattan! When I had visited New York a few years ago with a friend we got this awful shared bus thing which we paid loads more for! I don't know how we didn't crash then they just dropped us at Grand Central Station even though they told us they'd take us to our hotel!! 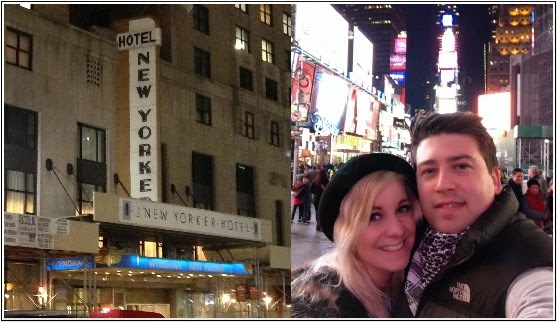 We stayed at the New Yorker which is in a great location in Manhattan, right by Madison Square Garden. I would definitely recommend this hotel, it was lovely although more expensive than i had hoped! New York is definitely an expensive place but I think it’s worth paying the extra to be in Manhattan as you can walk almost everywhere. New York was awesome, we did all the usual touristy stuff, Times Square, went up the Empire State Building and the Rockefeller Center, Grand Central Station, 5th Avenue, Central Park, all walking distance from the hotel. Found an awesome place called 2 Bros Pizza which was between our hotel and Times Square, $1 for a slice of NY pizza! 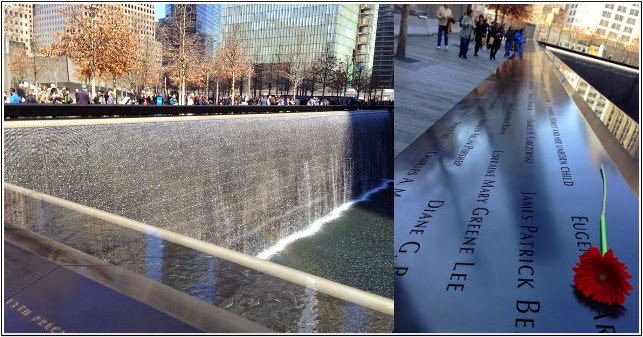 We got the subway to the World Trade Center and visited the 9/11 memorial, which was so sad, I thought I’d be fine but I got really upset, it’s so beautiful what they have done there though. We then went to the apartment building from Friends and Washington Square Park (In the movie I Am Legend, his apartment is right opposite this park, and there is a big arch which you instantly recognise from the film!) There was a man feeding all the pigeons, he was covered in them and we stopped to watch him, he then put some seed in my hand! Argh I got covered in them too!! That night we went to watch Wicked on broadway, it’s my favourite show and I’d already seen it 12 times in London!!! It was amazing!! Statue of Liberty cruise was the next thing we did, you should definitely book this online a while before you go as there is limited availability to go up into the crown! We missed out on this but we did get to go up to the pedestal, which has a little museum inside. When we went it was a horrible rainy cold day! That night we went to watch Lady Gaga!! I was so excited, I saw her once before in Manchester but this was a much smaller venue called the Roseland, we were so lucky that she was doing a week of shows the week we were in NY before the venue closed for good. We had to queue in the rain and my legs and feet killed but it was awesome!! When we left the Roseland we noticed that in the theatre right opposite was a play starring Bryan Cranston (Breaking Bad!) So we decided it might be worth waiting around to see if we could meet him when he came out the stage door! We even had an umbrella that someone had left on the floor at Gaga so we thought why not?! The line of people waiting for him got really big but he came out and had photos with everyone! We even got him to do a short video saying hello to my brother, who is the biggest Breaking Bad fan!! The next day we got the subway to Brooklyn and walked back over the Brooklyn Bridge to Manhattan. We saw loads of padlocks on the bridge where couples write their names on them and attach them to the bridge, I think the idea came from the bridge in Paris which is covered in them! There was a guy selling padlocks so we decided to add our own! Back in Manhattan we walked to Wall Street and saw the bull, then decided to try and find the fire station building from Ghostbusters! We sat in McDonalds on the free wifi working out on Google maps where it was! I am so bad at directions but Damo led the way! We then got on the Staten Island Ferry, which is free, in time to watch the sunset over the city. For our last day in New York we did the All Access Tour at Madison Square Garden, then skyped our friends who had just had a baby girl. We had done everything we had wanted to do so we got an early night ready for our flight to Las Vegas in the morning!